By Dan Ambrose: WBC super bantamweight champion Rey Vargas (33-0, 22 KOs) had to get up off the deck to defeat #3 WBC challenger Franklin Manzanilla (18-5, 17 KOs) by a tougher than expected 12 round unanimous decision last Saturday night in their fight on DAZN at the Fantasy Springs Casino, in Indio, California. In the second half of the fight, Vargas suffered a cut left eye from a clash of head. The cuts occurred from Vargas grabbing Manzanilla to clinch him when he was coming forward to throw shots. Vargas was constantly looking to hold at every opportunity, so the clash of heads was the end product of that. Vargas, 28, was dropped hard in round 2 after getting caught by a powerful left hook from Manzanilla as he was pulling away from having thrown a body shot. The knocked Vargas on his backside on the canvas. He was badly hurt. When Vargas got back up, he clinched the remainder of the round, and seemed annoyed that Manzailla was doing his best to get his hands free to try and finish him off. Vargas controlled the remainder of the fight in using his long reach, fast hands, and combination punching to outwork Manzanilla. The scores were 117-108, 117-108 and 117-108. Boxing News 24 scored it 9 rounds to 3 for Vargas. Manzanilla didn’t do enough to get the win. He was never going to be able to out-box a talented fighter like Vargas from the moment the fight was signed. Manzanilla’s best chance of winning was to try and knockout Vargas, and that’s what he was trying his best to do with no luck. It sounds like Vargas doesn’t quite realize that he was fighting dirty as well all throughout the fight. 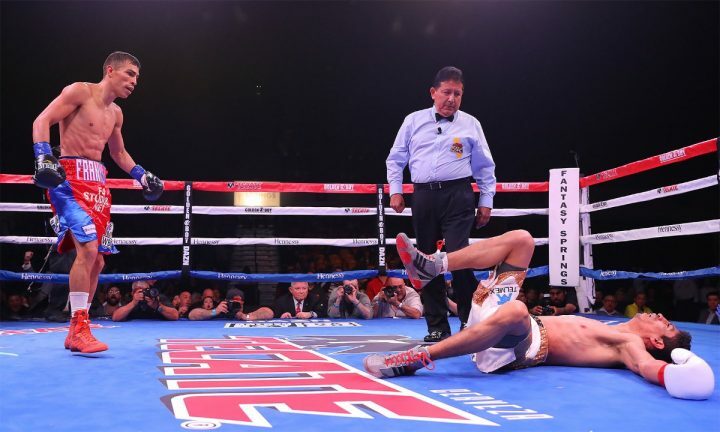 Vargas was clinching frequently and sticking his left arm far put in front of him to push Manzanilla to keep him from getting close to him to him all throughout the fight, especially in the championship rounds. Those are illegal tactics, and clearly not fighting in a fair manner. Whether one wants to call excessive clinching and pushing off as dirty tactics is open for debate. It’s certainly not fighting in a fair manner. Manzanilla was reacting to the constant holding that Vargas was doing. Instead of letting Vargas get away with the holding by just waiting for the referee to eventually peel him off of him, Manzanilla was continuing to fight while he was being held. He was hitting Vargas in the body and the side of the head while he was being held. Vargas clearly wasn’t used to that. Obviously, when Vargas has held his opponents in the past, they would just let him do it without fighting through the clinch. Boxers are supposed to keep fighting when their opponents are trying to use holding as a tool the way Vargas was doing. It was ultimately a move where Vargas was gaming the system, and Manzanilla wasn’t going for it. The referee Raul Caiz Sr. arguably should have penalized Vargas one or two times to get him to stop holding, because he was clearly using that tactic to neutralize Manzanilla’s offense. But for Vargas to be upset with Manzanilla for him fighting through the clinch, it seems he doesn’t understand the rules of boxing. Fighters that have an opponent that is using clinching as their main defensive tool to keep them from throwing punches, they’re supposed to do everything they can to keep fighting while they’re being held. Ideally, the referee is supposed to do his job and take points away from the offender that is using clinching as a neutralizing tool, but that didn’t happen last night. Vargas is going to have to learn how to fight guys without holding so much. You can bet that whoever fights Rey Vargas in the future, they’re going to make sure they follow the blueprint that Manznilla created by throwing punching while they’ve beld by him. Vargas was clearly bothered by Manzailla’s punches on the inside while he was holding, and it was tiring him out. “I haven’t fought anyone that tall before. I hurt him in the second round and I tried to continue that momentum. I feel I did well,” Manzanilla said. Manzanilla gave Vargas his toughest test of his nine year pro career. After the fight, Vargas said he wants to fight WBA super bantamweight champion Daniel Roman next if possible. That would be a good fight. Vargas didn’t mention WBO champion Emanuel Navarrete (26-1, 22 KOs). He would be an excellent opponent for Vargas to fight as well. It would be a more dangerous fight for Vargas than his match with Manzanilla, because Navarrete can punch with either hands and he’s almost as tall as the 5’7 1/2″ Vargas at 5’7″. If Vargas is going to beat Navarette, he won’t be able to count on doing it by using his height and reach like he did against Manzanilla last Saturday. Hopefully, Vargas wouldn’t hold Navarette all night long like he did with Manzanilla, because that would be awful to watch. It likely wouldn’t work at all for Vargas to clinch excessively against the 24-year-old Navarette, considering the’s a devastating puncher on the inside. If Vargas decides to clinch Navarette 10 times per round, he’s going to get hit hard while doing the holding, and it could lead to him being knocked out quickly. That’s a bad match-up for Vargas against Navarette. That might be one of the reasons why Vargas failed to mention his name. Vargas has a better chance of beating the short 5’5″ Daniel Roman, because he’s even shorter than the 5’7″ Manzanilla, who admitted that he was bothered by Vargas’ height last Saturday. Navarrete is coming off of a 12 round unanimous decision victory over World Boxing Organization super bantamweight champion Isaac Dogboe on December 8 last year. Those two are expected to face each other in a rematch soon.